3-6 BR & Loft Sleeps 16 Adults + Kids are FREE--Book Today!! **June-August, Holidays and Special Events Rates may vary. NO RESORT FEES!!!! 3, 4, 5, or 6 Wonderful Bedrooms PLUS Giant LOFT wtih 4 queen futons (rooms can be locked off), sleeps 16 adults PLUS your KIDS are FREE, and 3 Full Bathrooms Relaxing Steam Shower. FREE High Speed Cable Internet Access. EXCITING 8 Brand NEW FLAT TV'S in all the rooms, NEW 80 inch TV and Entertainment Theater in the family room, 3 60 inch TV's and more with NEW Granite and appliances in the kitchen and much more in NEW REMODEL (new Pictures coming soon). 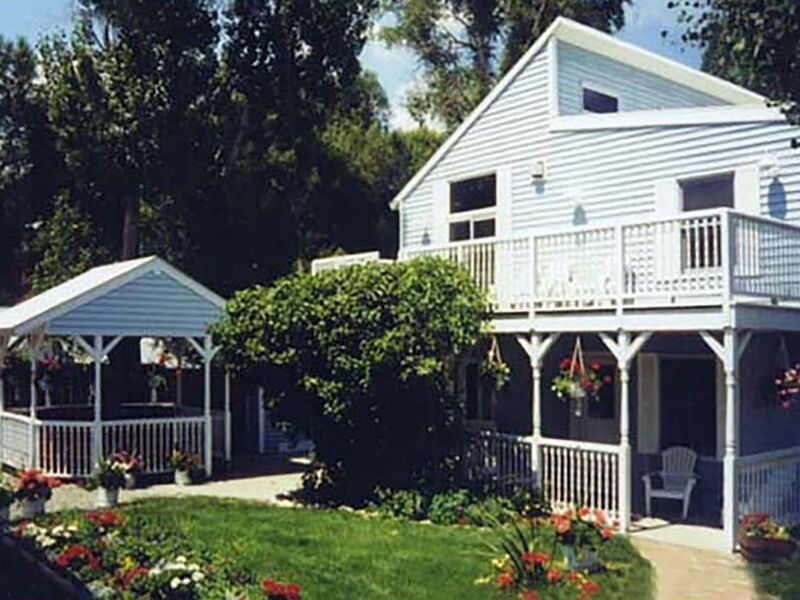 Wonderful Vacation Home located in downtown Steamboat Springs just two blocks from Main Street. Only five minutes to Mt. Werner or Howelsen Hill, public swimming pool, and only 1 block to FREE bus services to almost anywhere in the Steamboat Area. Home has 2 Great Living rooms available, Fully-Equiped Gourmet Country Kitchen it has everything, 3 Fireplaces, 1 King Bed in Master Bedroom, 3 Queen Brass Bedrooms, 2 Double-single bunk Beds, plus a loft that sleeps 8, plus 2 double-size roll-a-ways and crib. 8 NEW Flat Screen TVs, each has a Blu-Ray DVD Streaming Players, gas grill, washer, dryer, 6 phones, many EXTRAS for your comfort. Rates posted is for 5 bedrooms and loft, the 6th bedroom is $50 per night payable at check in if needed. Otherwise, 6th bedroom is locked off and not rented. Pet fee is $50 per pet requires permission from the owner, depends on pet and discipline no barking, howling , chasing other dogs, animals and etc in the neighborhood. I am a retired Educator and Professor, this home has been in the family since 1950 with 2 great Home Additions added in the 1990's that are now my Vacation Home for your use. I take great pride in makie it very nice with lots of EXTRAS for my guests. Great Downtown location 2 blocks from main street so you can walk to shopping, Movies, Public pool, parks and many Dining options for you. FREE BUS shuttle to Skiing and anywhere in Steamboat only 2 blocks away. Buses run about every 15 minutes, the ride to Skiing is about 10 minutes. So, you can come and go at any time without worries about parking. I am a member of the Pool and Recreation center so you will receive a DISCOUNT by just giving them my name, so you can enjoy the large natural hot springs pool, hot tubs and water slide for your entire family while you are in Steamboat. I have a few mountain bikes and river tubes for your use at my home. Free Cable WIFI, Private Hot Tub and 2 Steam Showers and lots more to make your vacation EXTRA SPECIAL!!! 2 Blocks from Main Street and Free Bus Shuttle to Ski Mountain about 8 minutes to Ski Area. 3 Wonderful Fireplaces, Great NEW HOT TUB and Gazebo, Family Room & Living Rooms available, 6 Phones, 8 Color Cable TV's (every room has their own private Cable TV), each has a VCR & DVD's, 2 Stereo's, Fully equipped Gourmet Country Kitchen even with condaments, Microware, Deluxe Cookware, Utensils and Dishes, Extra Large Washer & Dryer, Linens and towels are provided, Now for FUN STUFF, Tubs for the River, Even a small River Raft, Mountain Bikes at the house, all for your use!!! For your comfort, this is a NON smoking home and home is pet friendly and will be considered with owners notification and permission. The owner met us personally and gave us a tour and suggestions for eating in the old town. The larder was packed with starter food and kitchen was well equipped. He welcomed our babies and dogs. We loved walking down town and being free of cars. This is a good family lodge for three generations. Dr. Allen and Dr. Jane and their families were awesome guests. Their families were busy playing everyday, came home enjoyed the New Hot Tub and Steam Shower and more at my home, they were respectful of my home and left it in great condition. They are a wonderful family who I would love to have return to my home anytime!!! We had a great stay at your house in Steamboat. It was the perfect size and everyone was comfortable and had a blast. Easy transit to/from the slopes and the hot tub was perfect after a long day of skiing. Will definitely come back! Radhi and her friends were a wonderful group to have at my home. They were very respectful like it was their own home. They played hard skiing and more every day and enjoyed my home, hot tub and location to downtown. I would love to have them return here very soon. 5 Stars to them as guests at my home!!! This house is huge! There was plenty of space for our group (15 adults) to hang out. There was plenty of options for sleeping. The kitchen is very well equipped and very spacious. The 2 living areas have plenty of seating and awesome entertainment! Rick was a wonderful host who met us upon arrival to show us the house. The hot tub was amazing! It's great to be able to ski all day and come relax in the hot tub at night. Rick made himself available if we needed anything at all which was very comforting. The location of this house is perfect! It's a very short 2 minute walk to the bus stop. We were minutes from many restaurants and all of what downtown Steamboat had to offer! I've been coming to Steamboat for 4 years now and this is by far my most favorite location I've stayed at. There is also plenty of parking for vehicles. I was nervous about that being downtown but Rick has it set up perfectly for multiple vehicles. Jayme and her family were very AWESOME guests at my home in Steamboat Springs, they treated my home like it was their home with true respect and dignity. I was truly was honored to meet each of them, they played hard all day, skiing, ski mobiles and much more coming home to my NEW HOT TUB and relaxing and all the time being great guests, they felt like family at my home and much more. If you get a chance to meet Jayme and her entire family you will know exactly what I am talking about. I wish them the very best always!!!!! I can't wait for them to return here and stay at my home again, it will be my true HONOR!!! Hope you get a chance to meet them as well!!!! Very convenient spot, great service and welcoming host! Has 3 gas fireplaces as well for the instant heat when you need it. Thank you dr Rick for renting my family and friends your home for the week. We will see you again. I want to thank Tracy and her family for staying at my home, they were were AWESOME. They PLAYED so hard and had a great time here. Took great care of my home, treated it like it was their home and left it in great shape. I look forward when they return to Steamboat Springs and will always have a place to stay here at my home. They are a great family!!! Thank you again from the bottom of my heart!!! This was such a great time and this is going to become a family tradition of ours. Rick is so great and very accommodating and the location is unbeatable! Natalie's Family and their reunion were AWESOME, they had so much fun here and were very respectful at my home, it was a pleasure to have them here and they are welcome back anytime!! Truly a pleasure to have them here!!! NOTE all Rates are subject to change without notice until confirmation. Holiday, Special Events and weekend rates maybe higher. Rates posted are for 5 bedrooms (room can be locked off) if the 6 bedrooms is needed add $40 per night or $240 week (Sometimes price is higher for some dates require the 6th bedroom be used in the rental price).